playing with oil and water. I suppose it takes time and was not as messy as the last one. I still have to figure out if the shots should only be taken from the top, or also from the side. Very cool! I love how you play! fabulous. have never tried this. how do you get all the different colours? Pretty, did that YouTube link help?? This one is my fav yet. I bet you are having fun though and this is just gorgeous! Great effects. I must give this a try. This is so beautiful with all the colors. You have done a great job. I love all your colors in this one. Great job. You're getting to be a master at these, another great image. This is fantastic! Kind of retro. Really like the colors. This is really cool - love the clarity of the colors. Terrific job. Great capture. Might actually have to try this also. I got lots of little bubbles to Diana. I have heard that some people spend ages and photoshop them out. 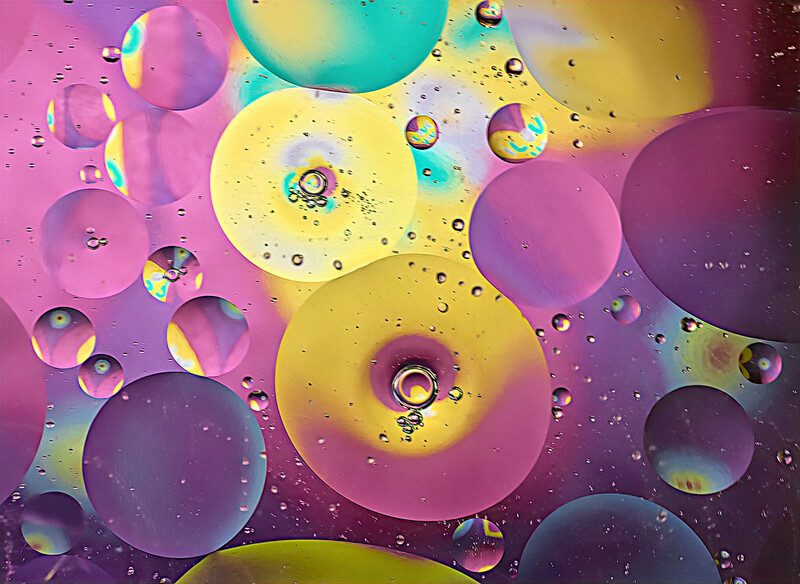 I got less bubbles when I used oil as my base and added drops of coloured water with a pipette. I need to have another play with this. @merrelyn that sounds like something worth trying Merrylyn, thanks. I wonder how @lynne5477 gets those perfect drops. @ludwigsdiana I used little, disposable hors d'oeuvre dishes (8cm X 5.5cm X 1cm deep), covered the bottom with a couple of MLS of olive oil, then used a pipette to drop water coloured with food dye. The light set up was similar to that in the link Jackie sent you but I used a single coloured card as the background.